Worried about kids and materialism and the constant desire for more? Learn how to raise non materialistic children and instill important values. Piles of holiday gifts. Extravagant parties. The desire for the latest toy and discarding the perfectly good ones they already have. Worse, looking down on other kids who don’t have the same things they do. Regardless of how much a child has, it’s easy to value materials and use it as a measure of self-worth. Materialism also doesn’t allow children to practice the skills that will serve them better in life, such as gratitude, empathy and delayed gratification. Materialism exists regardless of a family’s income. After all, anyone—from those with the least money to the most—can still want what they don’t have, and value them above other parts of their lives. So I do my best to raise non materialistic children, no matter our circumstances. I’ve found the best ways include focusing on the values you want to promote and redefining what it means to raise your child into the adult you want him to become. From us. Parents model behaviors that kids adapt for themselves, like when you show joy from having purchased a new television, or when your kids overhear your preference for high-end brands. They learn we place high value on material items, especially expensive or extravagant ones. From unhappiness. Like adults, kids can feel a void in their lives. These empty spaces can be due to low-income, low self-esteem and comparing themselves to others. Left unhappy, kids turn to material goods for the initial rush and satisfaction they provide. From the media. Television and advertising sell you on the idea that you don’t have enough. They want you to seek more material goods (especially their items) to fit right in. With a wider exposure to expensive lifestyles, kids turn to items for fulfillment and assume these things will make their lives better. Imagine having one skirt. It’s a good-quality, beautiful skirt you’ve worn and cherished over the years. Now imagine adding to your collection—maybe you have twenty skirts. That first skirt might start losing its appeal, its special-ness. Take that number even higher—let’s say you have 100 skirts hanging in your closet. Now how much will you cherish that first skirt—any of the skirts, really—when there are 99 others? Abundance is good… up to a point. After a while, your possessions become plain items you toss around with no meaning. Things aren’t cherished—they’re not enough. Soon, we’re on an endless chase for the next best thing instead of appreciating what we have. Kids notice this. Keep toys and play things to what’s enough for your kids and nothing more. Think about whether you kids need the latest learning tools (they usually don’t). Because the more you give, the higher the standards you set. Buying your son a toy car every weekend might bring joy those first few weeks, until he gets upset when you don’t come home with a toy. Rightly so—he has come to expect a toy every weekend and is upset when he doesn’t get one. Read more about the downsides of having too many toys. If you want your kids to be happy, ditch material gifts and give them experience gifts. Material gifts make us happy for three months before its novelty wears out, but the satisfaction of experiences last much longer. Think about the first time you purchased your phone. I’m guessing you took all precautions to keep it clean and marveled at the new features you can use. Fast forward a few months later and you probably toss your phone in your purse and forgot its hefty price tag. Then think about your last vacation, the date night with your partner, or the time you took your daughter to a museum. Those experiences make a more lasting impression compared to an item you’ll forget in three months. “Pillow game” involves both of them taking turns hugging a pillow and laughing after the fact. Both had a good time for something they made up and didn’t need any material items (I won’t count the pillow). You won’t find a price tag on a play date with friends or a special one-on-one moment with you. Should your kids want something that isn’t on your priority list, teach them to save or earn the money. Start a savings account for your kids where they can learn how to budget for big-ticket items. With a limited income, kids are forced to make hard decisions on what’s important and what isn’t. They’ll also learn how much time and effort goes into making purchases, and that money doesn’t come instantly. If your kids aren’t old enough to grasp the concept of saving, have them wait before you make your purchases. My eldest had been hankering for stickers for several weeks before I finally bought them. I could spend $2 to buy stickers, but I explained to him that I don’t want to use my money to buy stickers all the time. When your kids watch the latest ads about toy cars and junk food, they believe them as true. The less television and advertising kids watch, the less they’ll take advertising as truth. They won’t feel like they need these items to have fun, have friends and feel good. If your child happens to catch some advertising, deconstruct the message and encourage conversation. Let him know ads are trying to sell items, and discuss the ways they’re doing so. Talk about the smiling kids, the fast toys, bright colors and big text—all techniques advertisers use to get kids to buy their stuff. Gratitude reminds children how much they’re blessed and thwarts the desire for more stuff. Teach gratitude and giving. If your child has toys and clothes galore, remind her how thankful you are and for how much it took to give her these. When she receives gifts, focus more on how cool it is that Aunt Jane thought of her when she gave her a new play set. Discuss how loved she is by the people who showered her with presents. And encourage giving with your child. She can donate to charity, volunteer, or learn to share and give with other kids. An SSBE reader wrote how she tries to raise non materialistic children by taking her daughter out to shop, not to buy gifts for herself, but for other people. When we give, we’re reminded that we still have something to give in the first place. Raising non materialistic children isn’t about shaming luxury or downplaying the joy of new items. I love the feeling of getting something new, and we need material items to survive and enjoy life. But we can also help our kids shift the focus away from material goods and cast the sources of their joys wider. Limit how much stuff you give, even if you have the means to provide them. 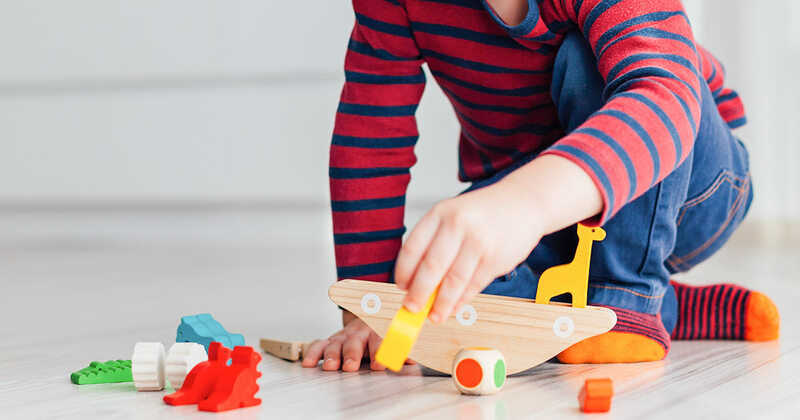 And when you do, focus on giving experience gifts over material ones—these will have a more lasting impression and teaches your child to value special moments. If your child wants something, have her earn or at least wait for it instead of giving it at her whim. 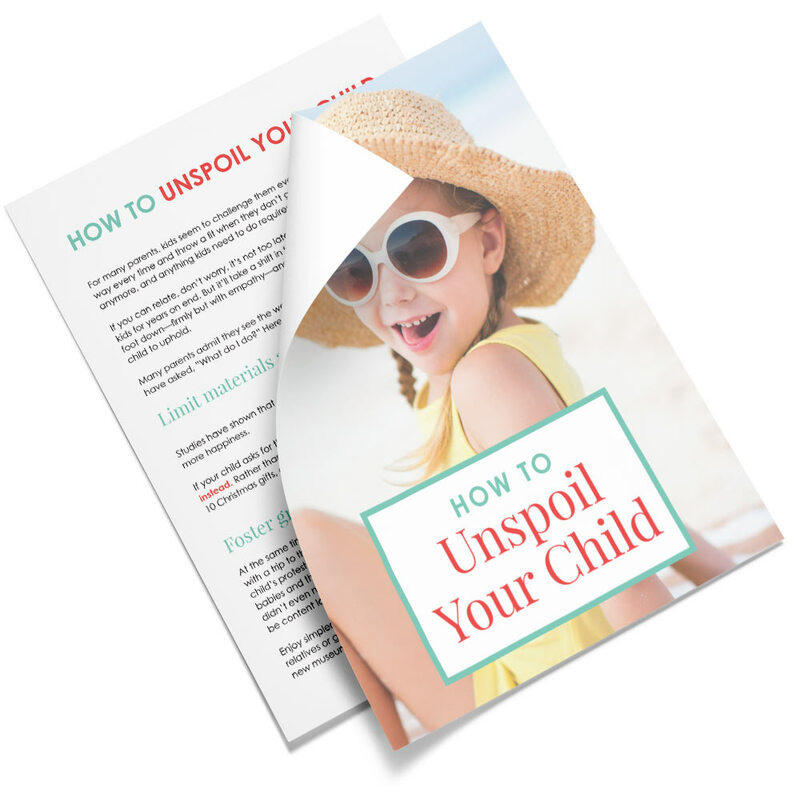 Avoid exposing her to advertising, especially if she’s younger than eight-years-old (and talk about what ads are trying to do if she happens to see a few). Finally, teach gratitude and the value of giving to others. This reminds her of how blessed she truly is with the life she has. Raising non materialistic children is important for every parent, regardless of income. It’s our way to raise future adults who will value joy not from material items, but from experiences, from others, and from their own intrinsic selves. 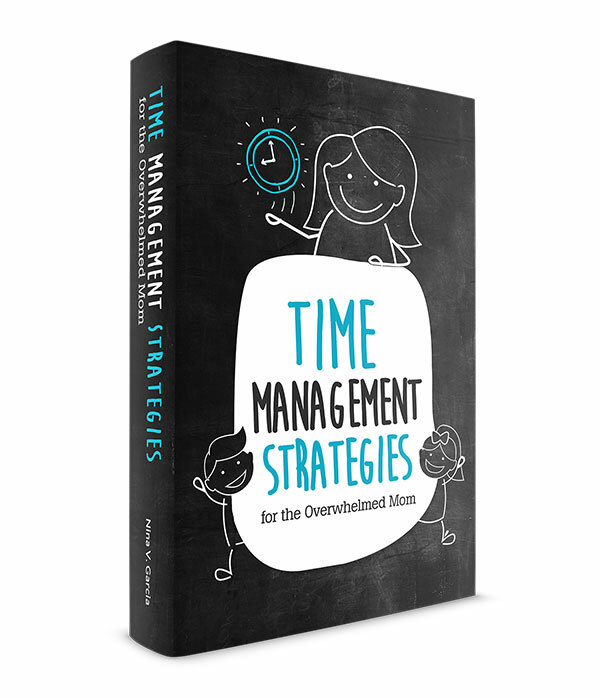 Overwhelmed with all the parenting advice you hear, but never get to actually implement? 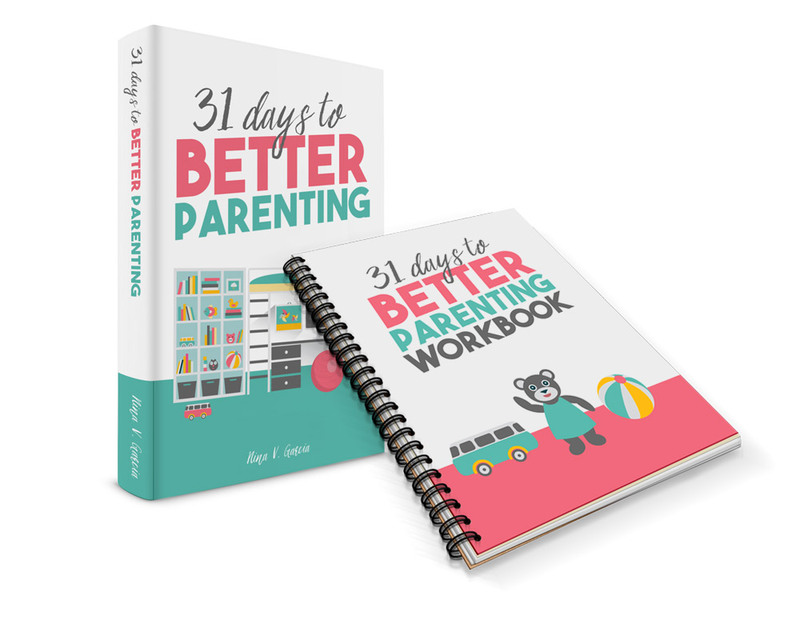 Grab my ebook, 31 Days to Better Parenting, for daily parenting tips you can apply right away and, more importantly, see immediate results. 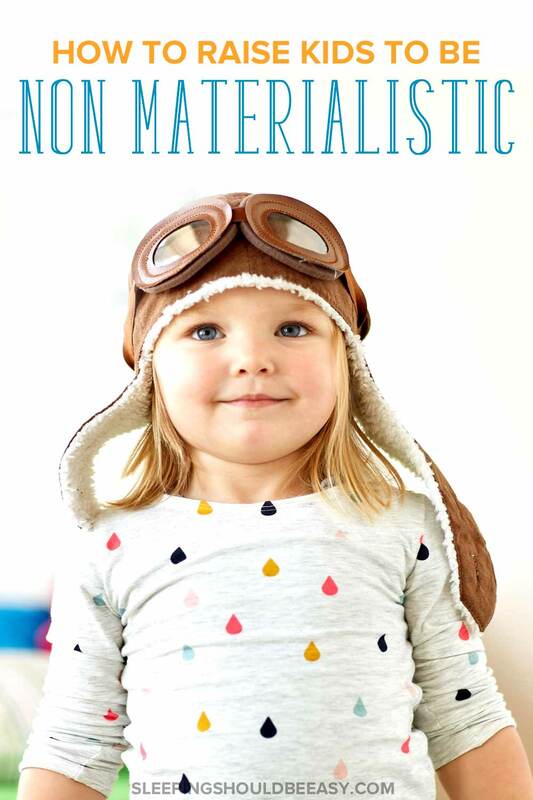 Did you like this article about how to raise non materialistic children? Share it on Pinterest and Facebook! It really helped us scale back on all the stuff and have a more simple, less materialistic holiday. A great lesson for the whole year, for sure! I’ve heard of the four gift rule. Definitely helps to narrow it down. We practice the “one gift rule” lol! This is hard for us. We could buy our kids more *stuff* but we’re reasonable people. However, the kids have materialistic grandparents who are the very definition of conspicuous consumers. And there’s nothing we can do to stop them. Shopping and gifts are Grandma’s love language. We usually travel in for the holidays – most of our extended family lives about 2 hours away. We’ve considered staying home for Christmas. We started staying home for Easter, and we have excluded the family from my son’s most recent birthday (“no party, just a few of his friends”) because we feel it’s damaging to them to get inundated with material gifts. I don’t want to exclude them but I don’t really know how else to do it when our requests to scale back are flat out ignored. The kids already think that Christmas and birthdays = presents and Grandparents mean new toys. We’re trying to undo all that. My four-year-old is starting to have this expectation too, Courtney. My mom visits every week, and several times she comes bearing little gifts, usually art supplies like paint and play dough. We’re of course grateful—these are gifts we would give our son on our own. Still, he has now associated her arrival with a gift. There are times when she doesn’t bring anything, and thankfully he doesn’t think twice about it or hold it against her. But it just goes to show how easily they can be conditioned to expect things, given enough time to form a pattern. I agree with all of your tips! My kids don’t watch television at all (they do see shows through Amazon Prime sometimes), and I find that that helps a lot in terms of protecting them from fads. But I particularly like your second point, that kids want more out of unhappiness. It’s so easy to look to objects for happiness, but in my experience it doesn’t work. Experiences and service are the best ways I have found to get a kid (or myself) out of an unhappiness funk. Yeah, that’s one of the big reasons why kids seek joy out of material goods—to fill the happiness they’re looking for. Unfortunately, that source isn’t sustainable or a high quality as, like you said, experiences and service and I’d like to add, relationships. I think you mentioned something very important here, that it isn’t about shaming luxury goods, it’s about instilling a sense of value. One thing I’ve always worried about when it comes to my husband is that he will spoil the kids rotten, and give them anything they want. I’m a big believer in you work for what you want, things aren’t handed to you, and that you work for more than “stuff.” The spouse is mostly on the same page but sometimes he’s such a softy I get a little nervous. Just like I’m nervous he’s gonna read this comment, lol. I love this post! Thanks! Come to think of it, Rebecca, I think our husbands are the same. Between him and me, he’d be the one who’d more likely “spoil” the kids. We’re both on the same page regarding money, but either he’s softer or I’m really strict lol. I think about materialism and spoiling my children all the time. I want them to be grateful for what they have. I like how you ended the post: this isn’t about shaming nice things or thinking badly about those who have nice things. Good point. We all appreciate nice and new things but hopefully we can be examples of how to appreciate those nice things. Right. There’s no way I can deny our natural instinct to express joy at receiving material items. You might even say that non-materialistic people are *so* enamored with receiving these once-in-a-while treats that they take as much joy out of it as they possibly can. Whereas materialistic people express joy… for a second, before tossing it to the side. I was just reading another blog post last week bringing up the same topic in relation to her kids’ birthday parties. She honest-to-God wasn’t wanting more toys and possessions to clutter up their house. She asked her readers if they thought it was tacky to request no gifts. I was shocked by how many said that yes, it was tacky. I really like the point you made about giving the gift of experiences. A lunch date with a favorite aunt, a zoo/museum membership, a day spent at the park on a picnic. Those are all fabulous ideas. I definitely want to go this route with my kids, but it feels hard with all their birthdays in the winter (and winter-ish for Iowa) months, along with the fact that we live in a small town hours away from the nearest zoo/kids’ museum. Looking back I love what my grandma did for me – for every grandchild actually. Once we reached the age of 8 or so she would take us out shopping for our birthday. She gave us money (along with our other grandparents and some from our parents) and we would pick out the presents we wanted – with her supervision. We also had to spend some of it on things we needed, like clothes. It helped us all learn money management (how badly do you really want that particular toy?) and it was an awesome way to spend a whole day with Grandma all by ourselves. We got to pick the restaurant for lunch, which was a big deal when still in elementary school. And it really wasn’t ever about what we were buying, it was about her time. She spent the whole day listening and engaging with her grandchild one-on-one. It is probably the best gift I have ever gotten. I am really hoping my mom is inclined to do the same thing with her grandkids. Do you have any favorite gifts you have given that were experiences vs. another toy to end up in the toy box? Our middle child turns 3 next month and seeing as she has a sister just one year older than her, we just don’t need any more toys. Vanessa, I LOVE your grandma’s gift idea! It sort of combines a grandma’s tendencies to “spoil” her grand kids while still ensuring that doing so includes quality time with her. I can imagine other people can also give activity toys like crayons, paints or play doughs, or board games, and then initiate a day when they get to use it together. I personally haven’t actually given another child who isn’t mine an experience gift. But for my kids, I actually don’t give them birthday gifts. Instead, we’ll throw a party, or take them out for a special treat or a restaurant, or a nice hang out at a kids place. It’s all about them that day, so I like to start them off with a special breakfast (like, four mini pancakes and four strawberries when my son turned four), then read four books (the last one was a new one—I guess *that* was a physical gift I gave him) at night. “Research shows that children under the age of eight are unable to critically comprehend televised advertising messages and are prone to accept advertiser messages as truthful, accurate and unbiased.” – WOW!!! I did not know this. I figured children would be influenced somewhat by Madison Avenue but not to the point where they weren’t able to decipher truth from non-truth! Yikes. Parents really have their work cut out for them! Thanks again Nina and take care. My best to all. Lyle, you’re right and thanks for including that point about peer pressure leading to materialistic kids. It’s my goal that my kids don’t strive to always have what their friends have. What do you think helped you develop that attitude as a kid? I think I was the same, almost to an extreme, where I was oblivious and ended up not really caring what everyone else had (and without sacrificing “social status”). I’m guessing I had a good support system where I didn’t feel like I needed to clamor for my peers’ attention or turn to materialistic goods to achieve them. This isn’t of course to say I was immune from the insecurities of middle and high school (I was very self conscious at times!) but I didn’t aspire to have what others had all the time. I will give you more of a detailed response in a new post soon since this has got me reflecting on my past. Thanks Nina and take care. Looking forward to reading it, Lyle. Living in a small two bedroom condo has really helped us limit our material possessions (for mommy and daddy, too). When Gavin was a baby, we registered for strollers (necessary in the city! ), but skipped exersaucers, swings, bouncers and even a high chair (making due with a travel version that hooks up to the table). Going forward, we made specific requests for grandparents to NOT buy big, bulky toys and playsets, pleading that we had no room. It was a life saver for us! Though, there’s plenty of time for Gavin to realize what his friends have that he doesn’t and to begin asking for it! I really needed this right now. We’ve been trying out an allowance system to help our 5-year-old earn the things he wants (mostly Legos) but it’s turned him into something of a greedy hustler. We’re trying to figure out a better approach, but when it comes down to it, I think we need to change the focus. I really like the idea of shifting from things to experiences. Thanks! Amy that’s my fear too, that my kids will end up focusing so much on money once they get a hang of how to earn it. I hope in time they’ll learn that it’s not always about money, while still being able to learn its ins and outs.